From Stralsund train station you take the Regional-Express (RE) directly to Sassnitz. When you arrived, there are directly driving buses to the National Park Center Königsstuhl (king's chair). Take the A20 from Lübeck in the direction of Rostock. Leave the A20 in the connection point Stralsund/ Insel Rügen/ Sassnitz and follow the B96. Over the Rügendamm to Sassnitz follow the road. Visit the smallest national park in Germany- the Jasmund National Park. The Park is characterized by its amazing beech grove, which belongs to the UNESCO- World Heritage. The Jasmund National Park is located on the island of Rügen. It's famous for the largest chalk cliffs, especially the so-called "Königsstuhl" (king's chair), wtih a hight of 118m. On this outdoor deck you have a wonderful view of the Baltic Sea. The National Park is a place for numerous rare plants and animals. In particular, it protects the largest contiguous beech grove area on the German Baltic coast. The national park offers different hiking trails, bridle path and possibilities to ride a bike. From Easter to October are daily guided walks on which you can obtain information about the national park for free. Especially for kids, they have climbing trees where you can shimmy from branch to branch or dangle in the side-swing. Visit the amazing exhibition of the National Park Center Königsstuhl. The exposition reveals the secrets of nature. On a journey through time you can expect lots of exhibits to touch and trying out. Numerous aquariums, a real icberg and many other attractions wait for you. Port of Sassnitz is an interesting place to visit. Many pubs, restaurants and small shops invite you to linger. In the pottery in the harbour you can watch the potters and acquire the maritime handmade souvenirs. 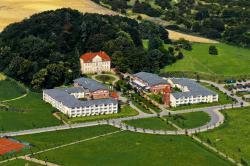 This 4-star resort hotel is in Neddesitz, in the Jasmund National Park, on the island of Rügen. It offers rooms and apartments, and sports facilities including tennis courts and bowling. The Jasmar Resort Rügen’s rooms are in the renovated manor. Just 100 metres from Sassnitz Harbour, this modern apartment offers great views of the Baltic Sea. Guests enjoy free Wi-Fi, a fully equipped kitchen and a spacious balcony. 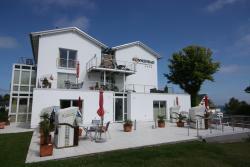 Appartementhaus Sonnenbad is located in Sassnitz, just 200 metres from the Baltic Sea coast and 6 km from the sandy beach. It offers bright apartments with free WiFi and sea views.